Matt bookmarked this recipe from Serious Eats last week to put on this week's dinner menu. It original came from Rick Bayless as a quick way to get the al pastor taste at home quickly. As I've mentioned before Matt loves Mexican food & would love to have it much more often than we do. 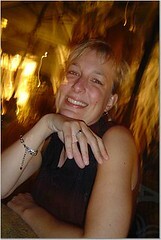 I like it as well but its often too hot for me to really enjoy. That was almost the problem with this dish, luckily I tasted the salsa before putting it on my tacos & knew right away not to put it on mine at all. Just the chipotle brushed on the pork chops before cooking was enough heat for me & the tacos were flavorful enough without it. We both really enjoyed the grilled pineapple on these tacos. Pineapple is so tasty grilled & a great accompaniment to the pork. Even though it was just canned pineapple, it was certainly a little touch of tropical in the midst of winter. Heat a skillet over medium heat. 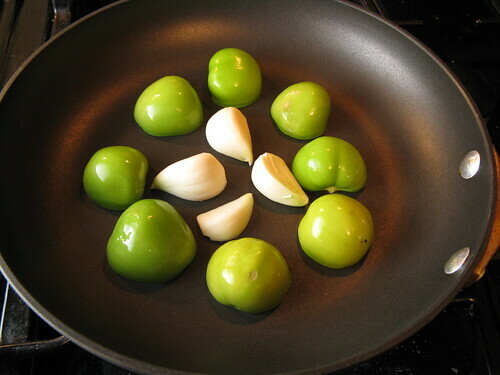 Place the tomatillos & garlic in the pan cut side down. Let cook for 3 minutes then flip & cook for 3 more. Put the tomatillos, garlic, 2 chipotles & a pinch of salt in a small food processor. Process until very smooth. Refrigerate until ready to use. Heat a grill pan or grill to medium-high. Process the remaining chipotles with a few drops of water. Use a brush to coat the pork chops with the blended chipotles (we went light with this because of my lack of heat tolerance). Put the pork chops, onion & pineapple on the grill. Cook until the pork chops are done (8-10 minutes). Remove everything to a cutting board & chop into small pieces. Serve on warm tortillas with the tomatillo & chipotle salsa. Would we make this again? We'll definitely do the pork, pineapple & onion combination again though just use a regular tomatillo salsa instead of this incredible hot chipotle version. I'm super excited to try this after seeing your post the other day. I miss Mexico! Where do you get your tortillas? I'm trying to find some good tortillas around here, and my only lead is to head to Lake Street. Hungry - The tortillas were nothing special just some we picked up at Lund's. We did notice there is a place that makes tortillas on Lake Street so that would be interesting to try. This looks wonderful. The grilled pineapple is an interesting touch. OMG, this looks so appetizing. I've never actually made a Rick Bayless recipe even though I've really liked his show when I caught it on PBS. It's really amazing sometimes how recipes with few ingredients can turn out so well. I love tacos - these look great! Really nice flavors! i don't think i'm alone in thinking that rick bayless makes some of the most enticing dishes ever. nicely done. Another thing I've never had - soft tacos - and tomatillos are a rare find as opposed to a regular grocery store item here. I so need to try the grilled pineapple! This looks like my kind of dish, heat and all! Grilled pineapple really makes this a must do. Great job! Looks great! I'll bet the pineapple was a pleasant addition. Nice touch with the pineapple. I bet it was hot. I can't put any more than one chipolte pepper in anything I make or the family will revolt. Love tacos el pastor and love that they derive from Middle Eastern immigrants to Mexico. Gyros all around the world! I've always wanted to try one of Rick Bayless' recipes, and this looks like a great one! 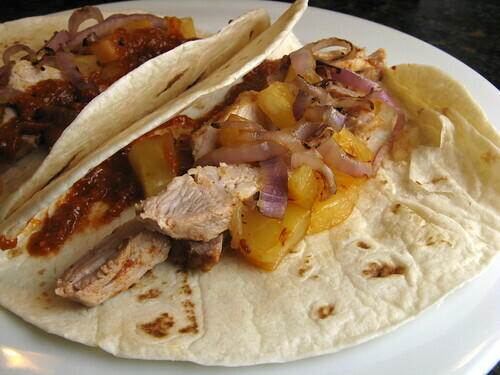 I like the sound of this quick way of making tacos al pastor! They look nice and tasty! Nice recipe.. How did I miss this? Thanks for letting us know about it.